What is a Be star ? 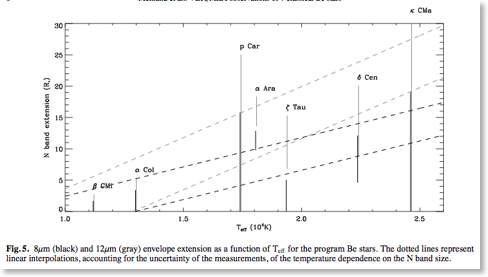 A Be star is a hot star, with a B spectral type, non supergiant, whose spectrum has, or had at some time, one or more Balmer lines in emission (Jaschek et al. 1981). They are presumed to be fast rotators spinning at 200 km/s or more (i.e. 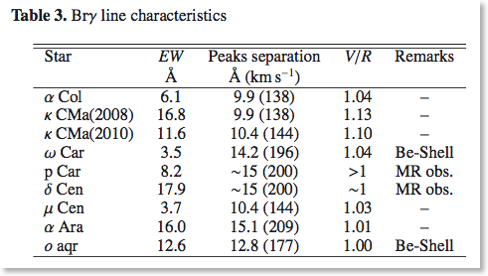 between 0.5 to 0.9 of their critical velocity) and have a large stellar wind and high mass loss rate. More recently you can find in the literature "active hot star" instead of Be star. They are normally on the main sequence or just beyond (0.5 or 1 more magnitude). It means that pre-main sequence Herbig Ae/Be and T-Tauri stars are not Be stars neither supergiants (Class I) or P-Cygni stars. - Be-shell stars which are Be stars with deep and narrow absorptions in their spectra. The are more often observed for Be stars with large Vsini. It means that these narrow absorptions are coming from the dense equatorial circummstellar region where the optical depth is the largest. - B[e] stars (see the text bellow) with forbidden emission lines in their spectra. These lines are often attributed to supergiants, which have lower density. They shown large IR excess,larger than those in Be stars and are due to circumstellar dust emission. Finally, a Be star can go through the Be-shell and B phases. At the present time, we don't know how a B star can become a Be or a Be-shell star and we don't know if all the B stars will become, one day, Be stars. Be stars in M45 original picture and spectra from Christian Buil 2006 by courtesy. Be stars are an important source of UV photons that are ionizing the circumstellar and interstellar environment up to a few hundred of parsecs. Thus, they are playing an important role in the heating of the gas in the arms of galaxies as well as the formation of radiative shocks in the interstellar medium. 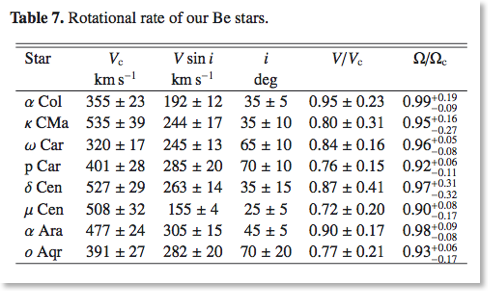 Moreover, in a given stellar field approximately 20 % of the B stars are in fact Be stars. This percentage can be much higher in some young clusters where up to 60-70 % of the B stars are showing the Be phenomenon, i.e. Balmer lines in emission and infrared excess. These stars are very bright and over luminous compared to B ``normal'' stars due to the presence of their circumstellar envelope. Thus, in young clusters, with many Be stars, the luminosity function may seem to contain too massive stars, leading to an artificially top-heavy Initial Mass Function (IMF). What causes B stars to become Be stars is not yet well understood. The proposed mechanisms include the wind compressed disk model of Bjorkman & Cassinelli (1993), the SIMECA code by Stee et al. 1994; 1995 based on the bi-stability effect proposed by Lamers et al. (1995), non-radial pulsations, magnetic activity and binarity. The optical/infrared and the ultraviolet observations of Be stars have been widely interpreted as being the evidence for the existence of two quite distinct regions in the circumstellar envelopes of these objects. The optical emission lines and the infrared excess are most probably produced in a dense rotating equatorial region, often called "equatorial disk". 1987). An important aspect of this traditional picture is that the equatorial region would be characterized by a very low radial expansion, as considered by Poeckert & Marlborough (1978) and by Waters and co-workers (1986; 1987; 1992). 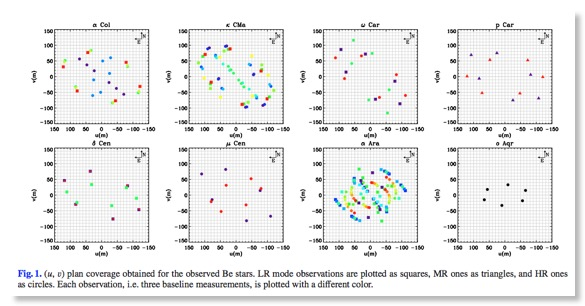 Interferometry in the visible has been used successfully to study the circumstellar environment of Be stars (Thom et al. 1986, Quirrenbach et al. 1993; 1994, 1995; Stee et al. 1995, Quirrenbach et al. 1997). See also the review given by Stee (2000). It is now clear that the matter responsible for the visible emission lines and the continuum is not spherically distributed. Thanks to the SIMECA code developed by Stee et al. 1994; 1995; 1998 we have carried out a study of theoretical HI visible Hα, Hβ, and near-IR Brγ line profiles for a large set of parameters (density, temperature, envelope oblatness, inclination angle). We have also computed energy distribution, intensity maps and corresponding visibility curves which allow us to conclude that the near-IR emission both in the Brγ line and the nearby continuum originates from a very extended region with a typical size of 40 stellar radii which is twice the size of the Hα emitting region. 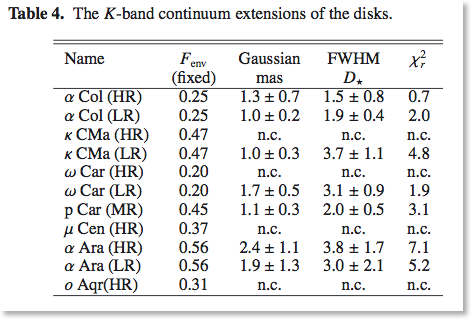 They can be compared with the following table which gives the extensions of the disk as a function of the wavelength. The maximal extent of the 6562 Angtrom map is 4 mas and the size of the central star is 0.45 mas. 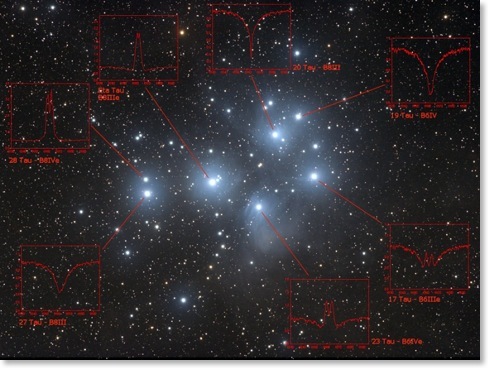 An animated picture of the open cluster NGC 663 exhibiting Be stars (red dots). Picture courtesy of Limber Observatory, from David Mc David. And sometimes, Be stars are used to “test” and calibrate new instruments as it can be seen with the first spectra obtained with the VLT focal instrument FORS showing Be star spectrum in the Open Cluster NGC 330 (in the Small Magellanic Cloud). Note the strong Hβ line in emission. We report the theoretical spectral energy distributions (SEDs), Brγ line profiles, and visibilities for two scenarios that can explain the disk dissipation of active hot stars and account for the transition from the Be to the B spectroscopic phase. 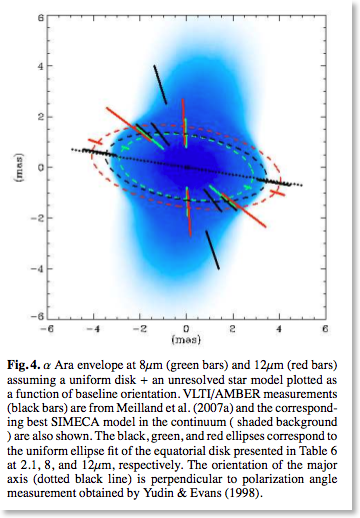 We have used the SIMECA code to investigate two scenarios, the first one where the disk is formed by successive outbursts of the central star. 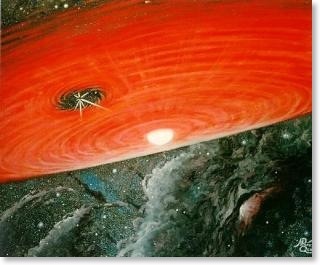 A low-density region is developing above the star and slowly grows outward and forms a ring-like structure that will gradually excavate the disk. The second one has a slowly decreasing mass loss due for instance, to a decrease in the radiative force through an opacity change at the base of the photosphere, and may also be responsible for the vanishing of the circumstellar disk. We find that a clear signature of the disk dissipation following the ring scenario will be the disappearance of the high velocity tails in the emission lines and a nearly constant peak separation. Moreover, we found that, following the ring-like scenario, the visibilities must show an increasing second lobe, an increase in the value of the first zero, and assuming an unresolved central star, a first zero of the visibility curves that appends at shorter baselines as far as the disk has been excavated. We propose to use the AMBER instrument on the VLTI to probe whether the ring scenario is the one to rule the Be phenomenon. 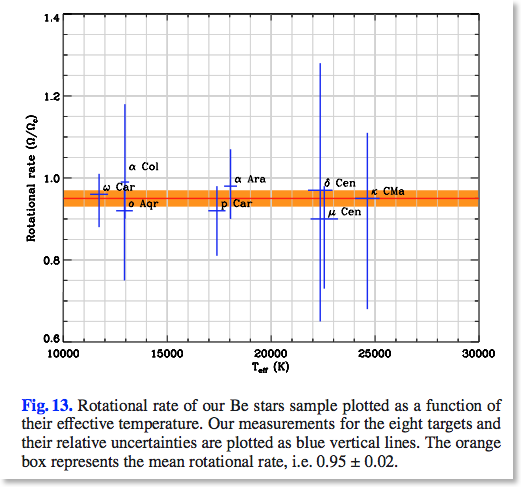 Is the Critical Rotation of Be Stars Really Critical for the Be Phenomenon? We aim to study the effect of the fast rotation, stellar wind and circumstellar disks around active hot stars and their effects on the formation and evolution of these massive stars. 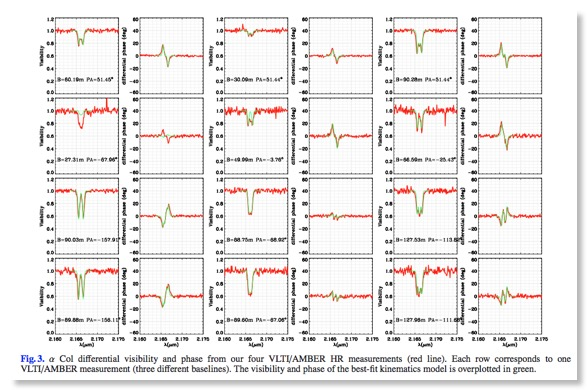 For that purpose, we obtained, for the first time, interferometric measurements of three active hot stars, namely α Arae, κ CMa and Achernar, using the VLTI /AMBER and VLTI/MIDI instruments which allow us to study the kinematics of the central star and its surrounding circumstellar matter. 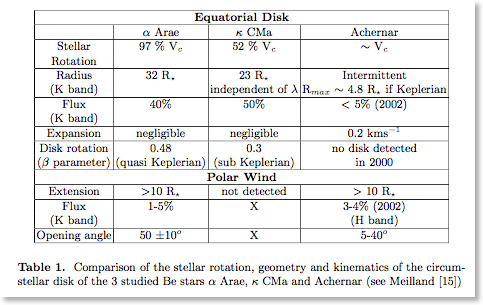 These data coupled with our numerical code SIMECA (SIMulation pour Etoiles Chaudes Actives) seem to indicate that the presence of equatorial disks and polar stellar wind around Be stars are not correlated. 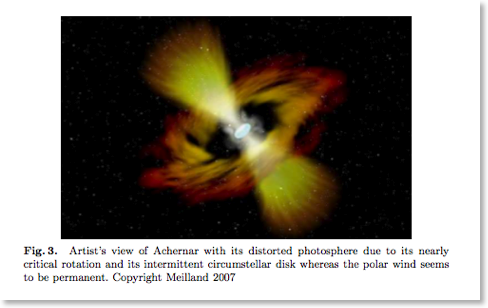 A polar stellar wind was detected for Î± Arae and Achernar whereas κ CMa seems to exhibit no stellar wind. On the other hand, these two first Be stars are certainly nearly critical rotators whereas the last one seems to be far from the critical rotation. Thus a polar stellar wind may be due to the nearly critical rotation which induces a local effective temperature change following the von Zeipel theorem, producing a hotter polar region triggering a polar stellar wind. This critical rotation may also explain the formation of a circumstellar disk which is formed by the centrifugal force balancing the equatorial effective gravity of the central star. Following these results we try to investigate if critical rotation may be the clue for the Be phenomenon. Classical Be stars are hot non-supergiant stars surrounded by a gaseous circumstellar envelope that is responsible for the observed IR-excess and emission lines. The origin of this envelope, its geometry, and kinematics have been debated for some time. We measured the mid-infrared extension of the gaseous disk surrounding seven of the closest Be stars in order to constrain the geometry of their circumstellar environments and to try to infer physical parameters characterizing these disks. band and compared our results with previous K band measurements obtained with the VLTI/AMBER instrument and/or the CHARA interferometer. 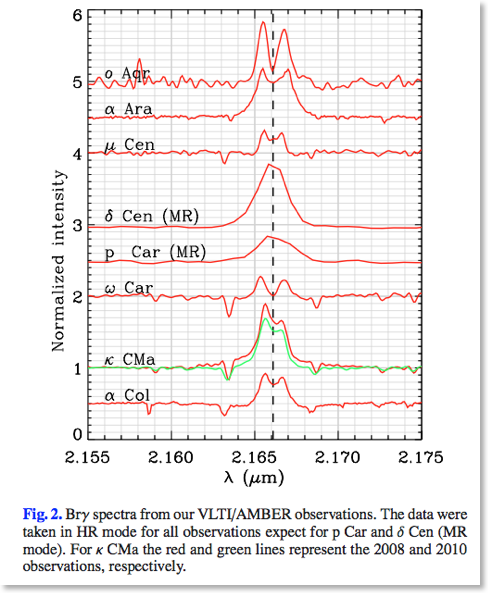 We obtained one calibrated visibility measurement for each of the four stars, p Car, ζ Tau, κ CMa, and α Col, two for δ Cen and β CMi, and three for α Ara. Almost all targets remain unresolved even with the largest VLTI baseline of 130m, evidence that their circumstellar disk extension is less than 10 mas. The only exception is α Ara, which is clearly resolved and well-ﬁtted by an elliptical envelope with a major axis a=5.8±0.8 mas and an axis ratio a/b=2.4±1 at 8 µm. This extension is similar to the size and ﬂattening measured with the VLTI/AMBER instrument in the K band at 2 µm. The size of the circumstellar envelopes for these classical Be stars does not seem to vary strongly on the observed wavelength between 8 and 12 µm. Moreover, the size and shape of α Ara’s disk is almost identical at 2, 8, and 12 µm. We expected that longer wavelengths probe cooler regions and correspondingly larger envelopes, but this is clearly not the case from these measurements. For α Ara this could come from to disk truncation by a small companion ; however, other explanations are needed for the other targets. Classical Be stars are hot non-supergiant stars surrounded by a gaseous circumstellar disk that is responsible for the observed infrared-excess and emission lines. The phenomena involved in the disk formation still remain highly debated. To progress in the understanding of the physical process or processes responsible for the mass ejections and test the hypothesis that they depend on the stellar parameters, we initiated a survey on the circumstellar environment of the brightest Be stars. To achieve this goal, we used spectro-interferometry, the only technique that combines high spectral (R = 12 000) and high spatial (θmin = 4 mas) resolutions. Observations were carried out at the Paranal observatory with the VLTI/AMBER instrument. We concentrated our observations on the Brγ emission line to be able to study the kinematics within the circumstellar disk. Our sample is composed of eight bright classical Be stars: α Col, κ CMa, ω Car, p Car, δ Cen, μ Cen, α Ara, and o Aqr. We managed to determine the disk extension in the line and the nearby continuum for most targets. We also constrained the disk kinematics, showing that it is dominated by rotation with a rotation law close to the Keplerian one. Our survey also suggests that these stars are rotating at a mean velocity of V/Vc = 0.82 ± 0.08. This corresponds to a rotational rate of Ω/Ωc = 0.95 ± 0.02. 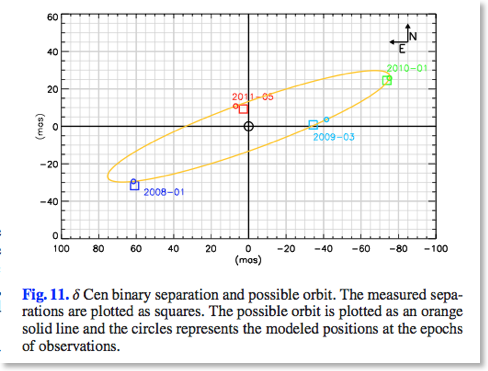 We did not detect any correlation between the stellar parameters and the structure of the circumstellar environment. Moreover, it seems that a simple model of a geometrically thin Keplerian disk can explain most of our spectrally resolved K-band data. Nevertheless, some small departures from this model have been detected for at least two objects (i.e., κ CMa and α Col). Finally, our Be stars sample suggests that rotation is the main physical process driving the mass-ejection. Nevertheless, smaller effects from other mechanisms have to be taken into account to fully explain how the residual gravity is compensated. Are we still working ? We also currently improving the SIMECA code in order to interpret the udge amount of VLTI data we still have and we will get in the following months: PhD and Postdoc students are welcome !